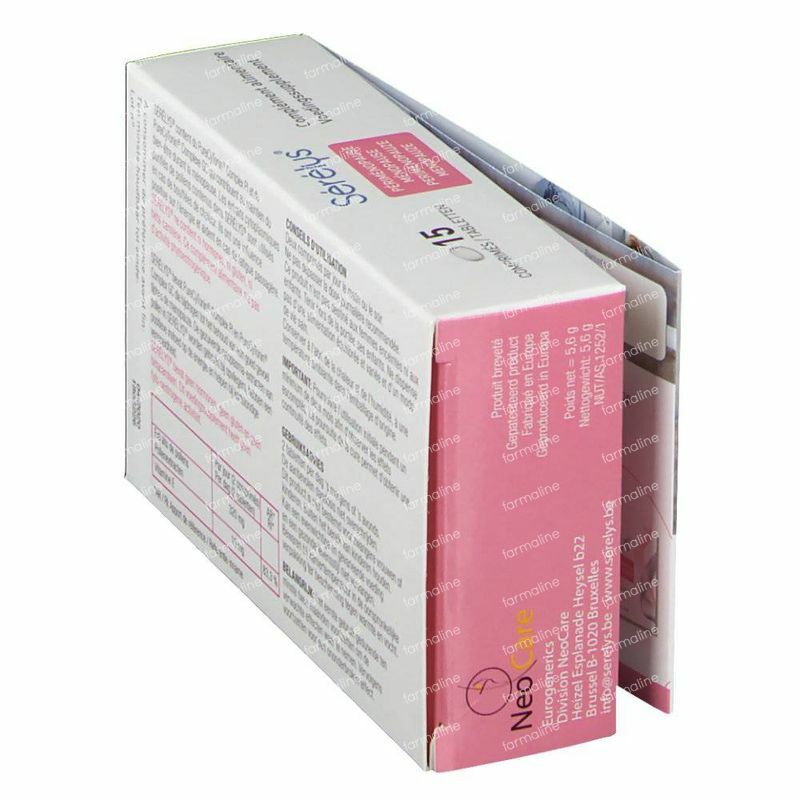 Sérélys 15 tablets order online. 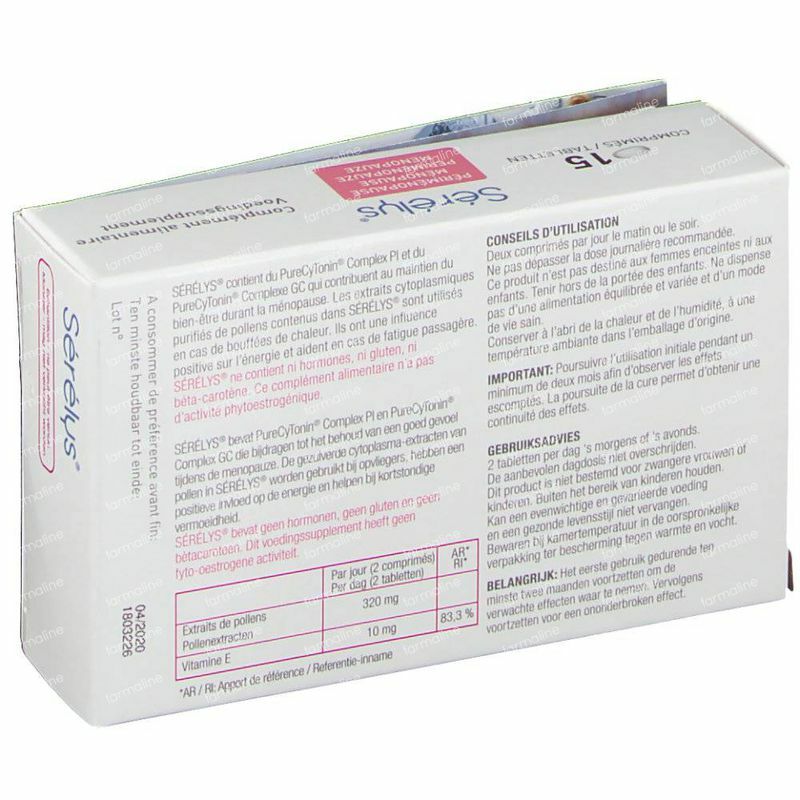 Sérélys is a dietary supplement for the symptoms of menopause. Sérélys is an innovative nutritional supplement from biotechnology that combines three active ingredients for the first time: - Vitamin E, which helps protect the cells against oxidative stress, - PI-82 concentrate, obtained from extracts of germinated pollen and pistils, - GC Fem-concentrate, obtained from various species of pollen extracts. Sérélys is produced in Sweden in accordance with applicable regulations. The pollen are processed by an exclusive and protected process whereby the active part of the pollen (cytoplasm) is extracted from his hard and waterproof shells (exine and intine). The shell of pollen carries the allergenic substances (allergens) from pollen: thanks to the exclusive extraction process of Sérélys, purified cytoplasm is obtained and removes all pollen allergens. Sérélys containing pollen extracts was studied in several scientific studies using appropriate methods in Sweden, Norway and Japan, among women who had hot flashes during perimenopause or menopause. Sérélys helps to preserve the well-being during menopause through the purified cytoplasmic extracts of pollen. The purified cytoplasmic extracts of pollen from Sérélys are used for hot flashes. They have a positive impact on energy and help with momentary fatigue. Dietary supplement to be used with the symptoms of menopause. Take 2 x daily 1 tablet with water. Concentrate P182/GC Fem 160 mg Vitamin E 5 mg-Isomalt-Microcrystalline cellulose Polysorbate 20-Maltodextrin-Spray-dried acacia Fish gelatin, hydrogenated cottonseed oil, colloidal anhydrous silica Calcium-Shellac-Talk. This product is not intended for pregnant women or children. Can't replace a balanced diet and healthy lifestyle. Do not exceed the recommended daily dose. Important: Because Sérélys is a natural product, the first use should be continued for at least two months to observe the expected effects. Continued treatment creates a continuous effect.